Austin in August is not cool. Austin itself is cool (as we’re constantly reminded), but it is toasty here during our summer months and August is the sweaty king of this heat-challenged time of the year. I think (hope!!) that the peak of the hot Austin summer has passed and we gardeners can look forward to the “second spring” flush of blooms which grace our gardens in September, October and November. 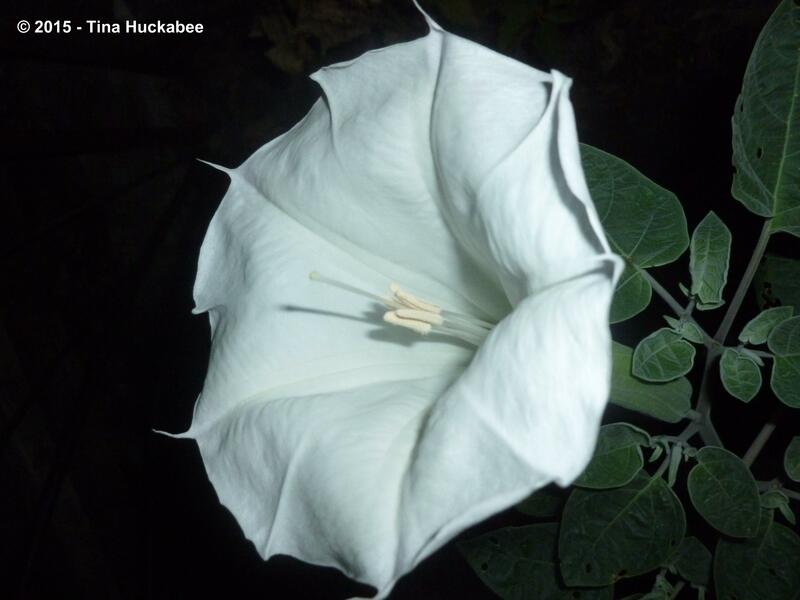 Until those glorious fall months, there is some cool in my garden in the form of the night-blooming Datura, Datura wrightii. ….into the early morning hours. I wasn’t quick enough document with the camera, but two small native bees busily worked in the center as the flower was closing early morning. Wild bee breakfast! The foliage is described as “coarse”, but I’ve always liked the muted grey-green color and the open form of this shrub. 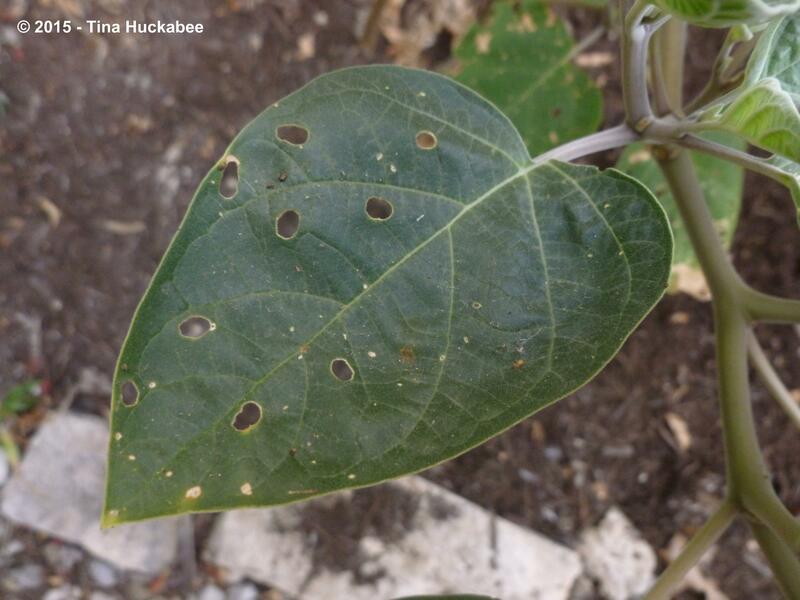 The foliage on my Datura has been a food source for something this summer and I’m guessing that the larvae of some variety of Sphinx Moth have enjoyed the greenery. 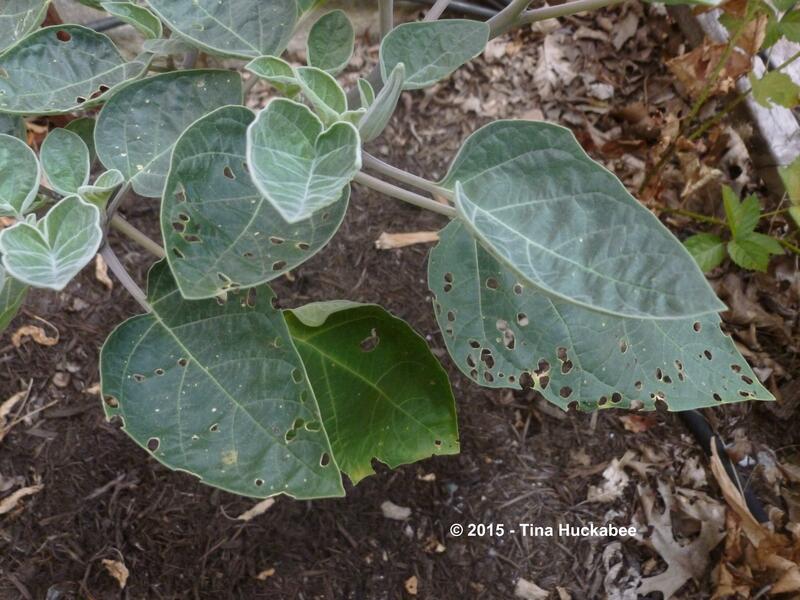 I haven’t seen any caterpillars, only the many holes they’ve decorated the Datura leaves with. I have seen Sphinx Moths in the garden this summer. 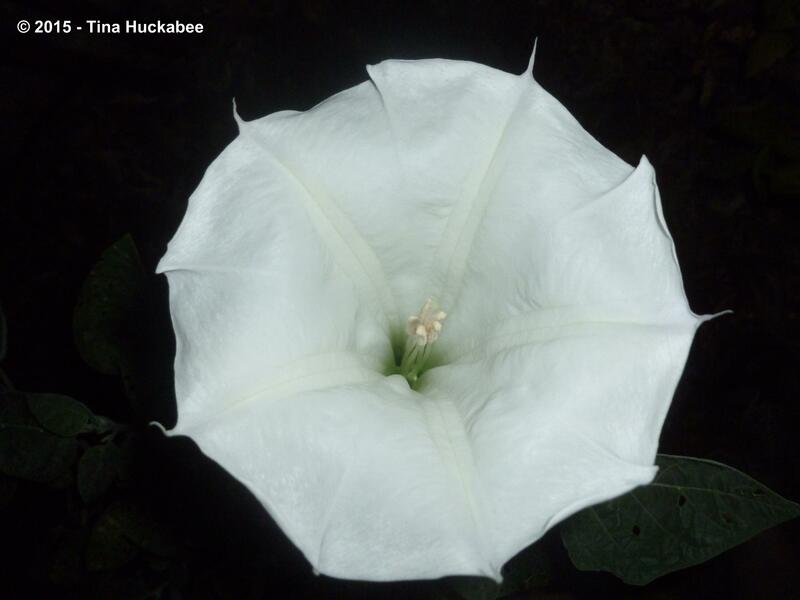 All parts of this plant are toxic and it’s well-known for its narcotic qualities; Datura was used in religious ceremonies of some Native Americans. Viewing these blooms is a sublime experience for me. 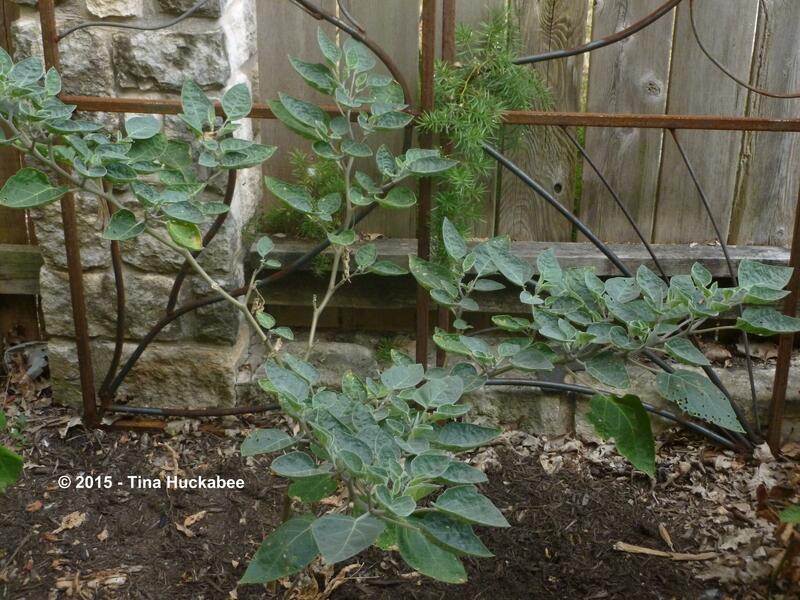 This entry was posted in Datura, Datura wrightii and tagged Native plants, Night Blooming Perennials, Wildlife Gardening by Tina. Bookmark the permalink. There’s a reason Georgia O’Keefe was enchanted by these blooms – they are absolutely stunning in size and form. For once I have a plant that is flowering in time, right along with the rest of the Austin garden scene. The largest of my three datura plants, in a bed close to our front door, is blooming up a storm, welcoming all sorts of night traffic. I too have seen sphinx moths around, they are irresistibly drawn by Datura. And though many write of the wonderful scent, I have yet to catch it. I tried again this AM, nearly bumped noses with a tiny bee of some sort in the attempt. To say we were both surprised is an extreme understatement! I’m not interested in allowing the plant to seed out so I’ve clipped the seed pods off as they formed this year and I think it encouraged more flower formation. Our record so far- 3 open flowers at a time. Swoon, Georgia O’Keefe! Datura are just gorgeous. You’ve mentioned that yours don’t have fragrance. Mine does, but I have to stick my nose into its depths–so far, no bee collisions! Last summer I think I also had a three-bloom-night, but so far this year, three-blooms-total. Like you, I snip off the spent blooms to encourage more of the flowering, but I love the seed pods! You’re right – the seed pods are great. Very other-worldly looking. I was tinkering with the idea if the plant didn’t put energy into seeds it might have more resources for blooming. And it seems to work that way but it could just be this one plant is quite mature now and that explains the increase in flowers. I think that’s the flower-production ticket. My Datura is only in its second summer, but it bloomed decently last year. That is a classy looking flower. Well worth a nocturnal jaunt outside to check it out. It looks lovely as it unfurls too, like a japanese umbrella. Great shots! Isn’t it a gorgeous piece of work? It does look rather like an umbrella! This is a very underrated plant. Maybe because the blooms are easy to miss. Maybe you will encourage others to grow this.I have already missed two blooms and await another. I think you’re right. Folks often don’t traipse through the garden at or after sundown and that’s when the action happens with this plant. I’ve also had three blooms this season, the third of which I missed! They are indeed cool plants! Beautiful images. 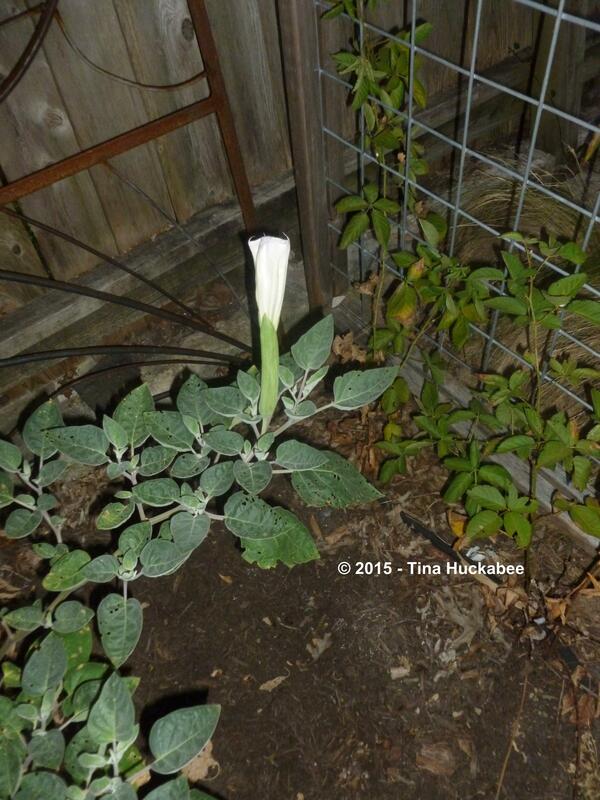 We sometimes have Datura inoxia in a container, shared by our neighbour (flowers with a shade of lavender). Fascinating to watch the flowers opening in the evening. All of the datura plants are just stunning and I agree that it’s quite remarkable to watch the unfurling. I staretd my datura from seed collected last fall. I missed the first bloom darnit. But to be honest I am just happy it is alive. This is one of my favourite wild plants. I love everything about it: form, structure, colour, etc. But I really like the whole idea of moon gardens here where it can be so pleasant to be outside in the evening. Yes to all of the above. 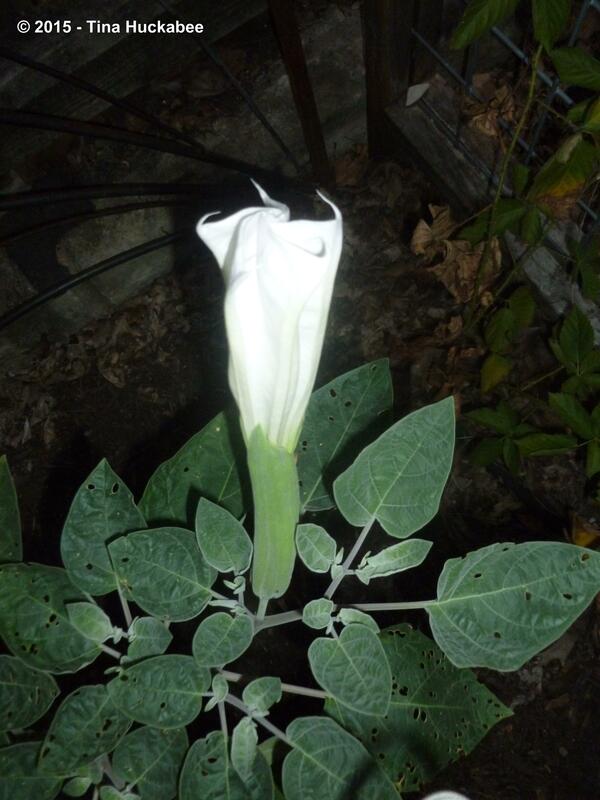 I love the night bloomers, though I only have one datura and several four o’clocks. So pretty though after the long, hot days. I bought my datura last summer when I finally figured out a spot for it. So glad I have it! I know the moonvine, or at least a moonvine. Beautiful, creamy flowers! Nice! 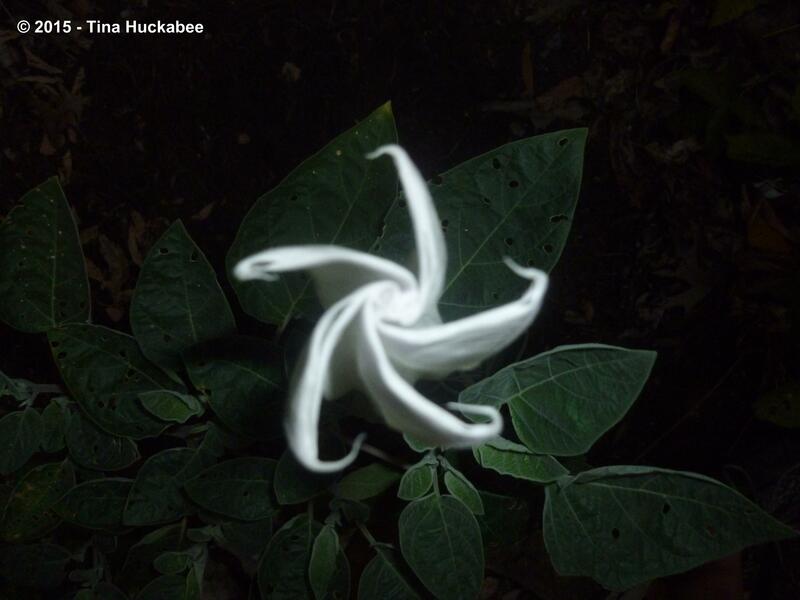 Your lovely photos remind me that my annual moonflower, another white nightbloomer, that has completely covered an obelisk with its leaves has yet to produce a single bud, much less a bloom! I am glad that the datura flowers earlier. Ms. Mariposa just ahead of you also grows moonflower–I’ll bet it’s the same. Datura tends to start its blooming mid-summer here. Currently, there are SIX blooms that will open in the next week or so. Woot!! 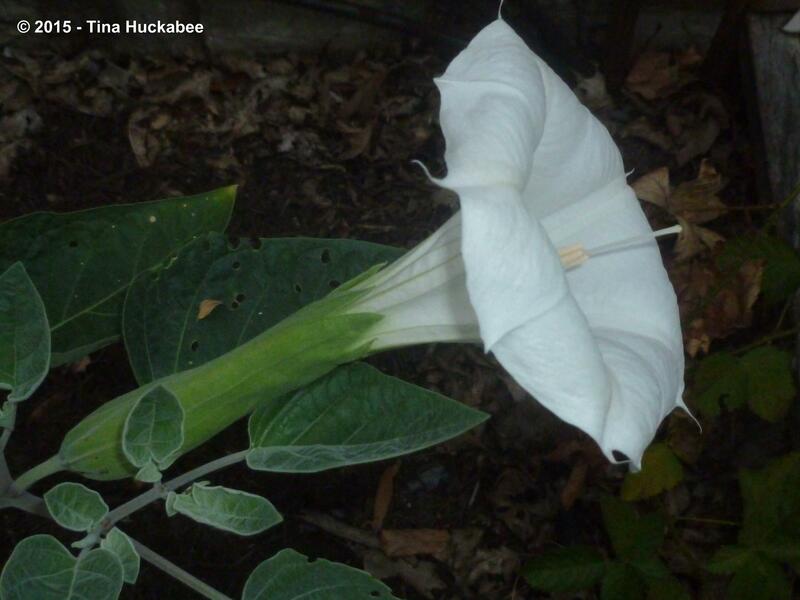 I hope your moonflower opens and graces your garden very soon. Love the photos. Does give one the image of coolness on a hot summer day…or night. Creamy, cooling white blooms and there are more on the way-welcome on a hot summer evening. 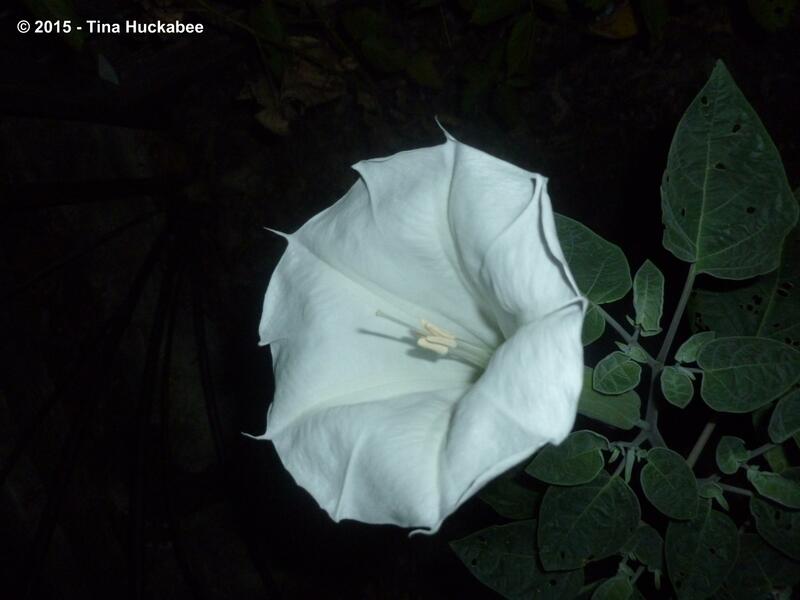 It’s definitely datura season, and I recently had fun photographing mine at night too. You got some great captures. Beautiful plant and flowers, right?? 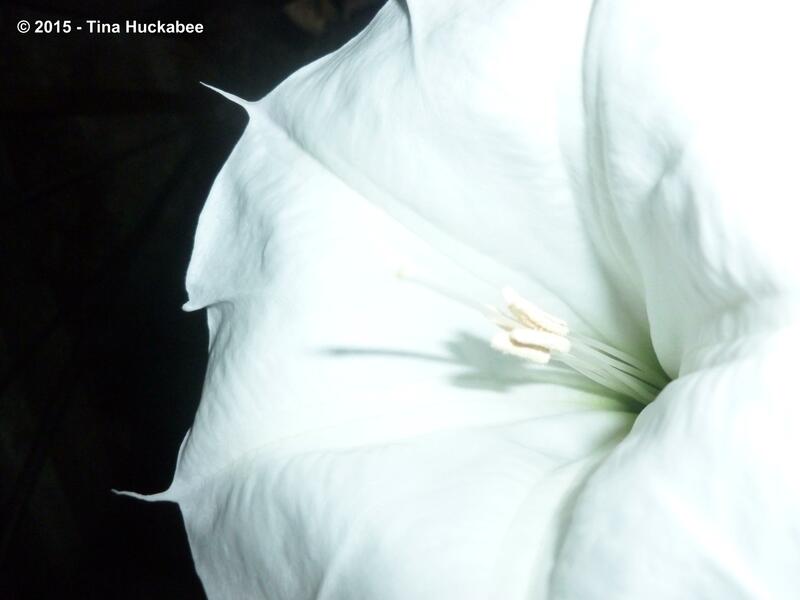 Thanks for commenting last night–it reminded me to go out and check the datura and I was rewarded with the sight of two stunning blooms! It is datura season. Lovely Datura! A friend gave me some seeds early this year but alas, I think they were washed away by the rains. I still have a few that I’ll try to grow in pots next spring. Yours are so pretty. I especially like the picture of the swirly unopened flower. Great shot! I hope you can grow it, Anna. It took me a long time to find the right spot for one and while that particular spot is out-of-the-way, I definitely traipse out each evening to have a look at those gorgeous blooms.